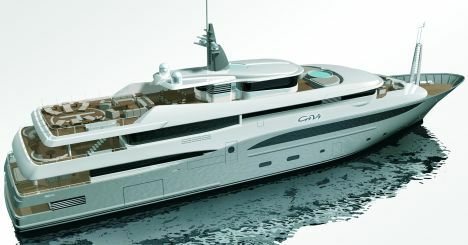 M/Y "GIVI" launched last July by CRN will be making its debut at the Monaco Yacht Show, the annual razzmatazz which takes place every September gathering all the major producers in the business. 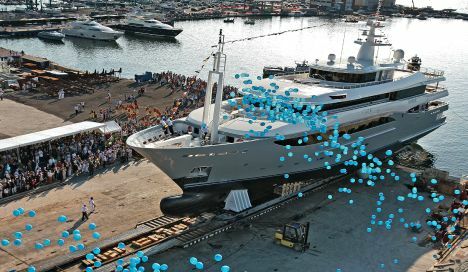 The 60 metre yacht by the Ancona based shipyard was designed in collaboration with the Zuccon International Project Studio and sports once again the stern "beach" area which protrudes off the lower deck but is also reachable from the main deck, successfully first presented on the CRN 54 "Ablity" of recent construction. It is the epitome of the "wellness within wellness" philosophy coined by the shipyard from Ancona. The "beach" is in fact, a wellness area of some 24 square metres which includes a roman Turkish bath as a symbol of the standard of comfort attained for the benefit of the owner and his guests. Designed and built for long voyages, the "GIVI" disposes of a steel hull and an aluminium super structure which hosts five decks fitted out to welcome in utmost luxury 12 guests and 20 crew members. The latter have been attributed the whole of the lower deck which CRN has designed to contain all the accommodation and machine rooms, whilst the owner and his guests share the forward space of the main deck. Considerable attention has also been given to the internal and external common areas which have been distributed intelligently between the decks. The saloons on the main and upper decks have been equipped with the ultimate entertainment technology whilst the open air lovers may enjoy the cruise from the Sun Deck which offers bars, dining areas, swimming pool, Jacuzzi, and of course 'sunning' areas. For further information please contact: CRN; Via E.Mattei 26; 60125 Ancona; tel. 071 501111; fax 071 200008; web site www.crn-yacht.com; e-mail info@crn-yacht.com. Class: LR Maltese Cross 100-A1-SSc-"Y", Mono, G6, Maltese Cross LMC, MCA Compliance.